(1).Grade 1 can be used in the drawing parts for its good elongation and excellent corrosion-resistance. (3).Grade 3 is almost used in pressure,vessel. (7). Alloy grade 9(Ti-3Al-2.5V) is the most widely used in the golf clubs and bicycle girders. (8). Alloy grade 23, ELI(extra low interstitial),can be used in the medical appliance. Application: Petroleum, gas, chemical industry, electric power, metallurgy, pharmacy, Shipyard,Pressure vessel,etc. Looking for ideal Good Quality Titanium Fittings Manufacturer & supplier ? We have a wide selection at great prices to help you get creative. All the Titanium Pipe Fittings are quality guaranteed. 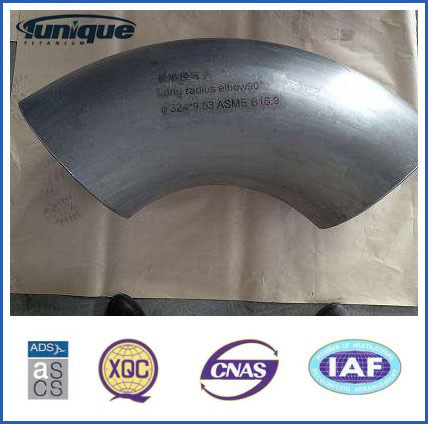 We are China Origin Factory of ASTM B363 Titanium Fittings. If you have any question, please feel free to contact us.